Also called St. Elizabeth of Thuringia, born in Hungary, probably at Pressburg, 1207; died at Marburg, Hesse, 17 November (not 19 November), 1231. She was a daughter of King Andrew II of Hungary (1205-35) and his wife Gertrude, a member of the family of the Counts of Andechs-Meran; Elizabeth's brother succeeded his father on the throne of Hungary as Bela IV; the sister of her mother, Gertrude, was St. Hedwig, wife of Duke Heinrich I, the Bearded, of Silesia, while another saint, St. Elizabeth (Isabel) of Portugal (d. 1336), the wife of the tyrannical King Diniz of that country, was her great-niece. In 1211 a formal embassy was sent by Landgrave Hermann I of Thuringia to Hungary to arrange, as was customary in that age, a marriage between his eldest son Hermann and Elizabeth, who was then four years old. This plan of a marriage was the result of political considerations and was intended to be the ratification of a great alliance which in the political schemes of the time it was sought to form against the German Emperor Otto IV, a member of the house of Guelph, who had quarrelled with the Church. Not long after this the little girl was taken to the Thuringian court to be brought up with her future husband and, in the course of time, to be betrothed to him. The court of Thuringia was at this period famous for its magnificence. Its centre was the stately castle of the Wartburg, splendidly placed on a hill in the Thuringian Forest near Eisenach, where the Landgrave Hermann lived surrounded by poets and minnesingers, to whom he was a generous patron. Notwithstanding the turbulence and purely secular life of the court and the pomp of her surroundings, the little girl grew up a very religious child with an evident inclination to prayer and pious observances and small acts of self-mortification. These religious impulses were undoubtedly strengthened by the sorrowful experiences of her life. In 1213 Elizabeth's mother, Gertrude, was murdered by Hungarian nobles, probably out of hatred of the Germans. On 31 December, 1216, the oldest son of the landgrave, Hermann, who Elizabeth was to marry, died; after this she was betrothed to Ludwig, the second son. It was probably in these years that Elizabeth had to suffer the hostility of the more frivolous members of the Thuringian court, to whom the contemplative and pious child was a constant rebuke. Ludwig, however, must have soon come to her protection against any ill-treatment. The legend that arose later is incorrect in making Elizabeth's mother-in-law, the Landgravine Sophia, a member of the reigning family of Bavaria, the leader of this court party. On the contrary, Sophia was a very religious and charitable woman and a kindly mother to the little Elizabeth. The political plans of the old Landgrave Hermann involved him in great difficulties and reverses; he was excommunicated, lost his mind towards the end of his life, and died, 25 April, 1217, unreconciled with the Church. He was succeeded by his son Ludwig IV, who, in 1221, was also made regent of Meissen and the East Mark. The same year (1221) Ludwig and Elizabeth were married, the groom being twenty-one years old and the bride fourteen. The marriage was in every regard a happy and exemplary one, and the couple were devotedly attached to each other. Ludwig proved himself worthy of his wife. He gave his protection to her acts of charity, penance, and her vigils and often held Elizabeth's hands as she knelt praying at night beside his bed. He was also a capable ruler and brave soldier. The Germans call him St. Ludwig, an appellation given to him as one of the best men of his age and the pious husband of St. Elizabeth. They had three children: Hermann II (1222-41), who died young; Sophia (1224-84), who married Henry II, Duke of Brabant, and was the ancestress of the Landgraves of Hesse, as in the war of the Thuringian succession she won Hesse for her son Heinrich I, called the Child; Gertrude (1227-97), Elizabeth's third child, was born several weeks after the death of her father; in after-life she became abbess of the convent of Aldenburg near Wetzlar. Shortly after their marriage, Elizabeth and Ludwig made a journey to Hungary; Ludwig was often after this employed by the Emperor Frederick II, to whom he was much attached, in the affairs of the empire. In the spring of 1226, when floods, famine, and the pest wrought havoc in Thuringia, Ludwig was in Italy attending the Diet at Cremona on behalf of the emperor and the empire. 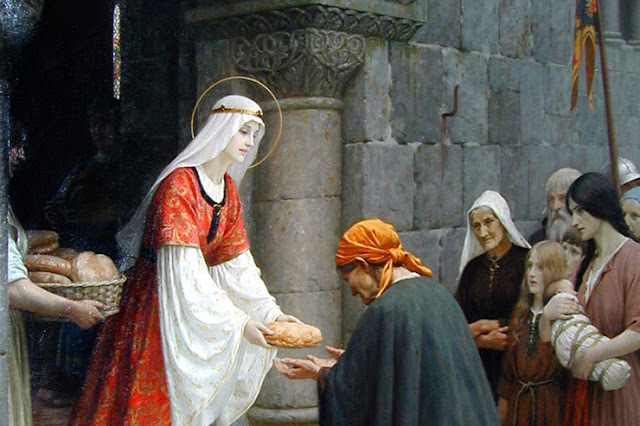 Under these circumstances Elizabeth assumed control of affairs, distributed alms in all parts of the territory of her husband, giving even state robes and ornaments to the poor. In order to care personally for the unfortunate she built below the Wartburg a hospital with twenty-eight beds and visited the inmates daily to attend to their wants; at the same time she aided nine hundred poor daily. It is this period of her life that has preserved Elizabeth's fame to posterity as the gentle and charitable Cheatelaine of the Wartburg. Ludwig on his return confirmed all she had done. The next year (1227) he started with the Emperor Frederick II on a crusade to Palestine but died, 11 September of the same year at Otranto, from the pest. The news did not reach Elizabeth until October, just after she had given birth to her third child. On hearing the tidings Elizabeth, who was only twenty years old, cried out: "The world with all its joys is now dead to me." The fact that in 1221 the followers of St. Francis of Assisi (d. 1226) made their first permanent settlement in Germany was one of great importance in the later career of Elizabeth. Brother Rodeger, one of the first Germans whom the provincial for Germany, Caesarius of Speier, received into the order, was for a time the spiritual instructor of Elizabeth at the Wartburg; in his teachings he unfolded to her the ideals of St. Francis, and these strongly appealed to her. With the aid of Elizabeth the Franciscans in 1225 founded a monastery in Eisenach; Brother Rodeger, as his fellow-companion in the order, Jordanus, reports, instructed Elizabeth, to observe, according to her state of life, chastity, humility, patience, the exercise of prayer, and charity. Her position prevented the attainment of the other ideal of St. Francis, voluntary and complete poverty. Various remarks of Elizabeth to her female attendants make it clear how ardently she desired the life of poverty. After a while the post Brother Rodeger had filled was assumed by Master Conrad of Marburg, who belonged to no order, but was a very ascetic and, it must be acknowledged, a somewhat rough and very severe man. He was well known as a preacher of the crusade and also as an inquisitor or judge in cases of heresy. On account of the latter activity he has been more severely judged than is just; at the present day, however, the estimate of him is a fairer one. Pope Gregory IX, who wrote at times to Elizabeth, recommended her himself to the God-fearing preacher. Conrad treated Elizabeth with inexorable severity, even using corporal means of correction; nevertheless, he brought her with a firm hand by the road of self-mortification to sanctity, and after her death was very active in her canonization. Although he forbade her to follow St. Francis in complete poverty as a beggar, yet, on the other hand, by the command to keep her dower she was enabled to perform works of charity and tenderness. Up to 1888 it was believed, on account of the testimony of one of Elizabeth's servants in the process of canonization, that Elizabeth was driven from the Wartburg in the winter of 1227 by her brother-in-law, Heinrich Raspe, who acted as regent for her son, then only five years old. About 1888 various investigators (Börner, Mielke, Wenck, E. Michael, etc.) asserted that Elizabeth left the Wartburg voluntarily, the only compulsion being a moral one. She was not able at the castle to follow Conrad's command to eat only food obtained in a way that was certainly right and proper. Lately, however, Huyskens (1907) tried to prove that Elizabeth was driven from the castle at Marburg in Hesse, which was hers by dower right. Consequently, the Te Deum that she directed the Franciscans to sing on the night of her expulsion would have been sung in the Franciscan monastery at Marburg. Accompanied by two female attendants, Elizabeth left the castle that stands on a height commanding Marburg. The next day her children were brought to her, but they were soon taken elsewhere to be cared for. Elizabeth's aunt, Matilda, Abbess of the Benedictine nunnery of Kitzingen near Würzburg, took charge of the unfortunate landgravine and sent her to her uncle Eckbert, Bishop of Bamberg. The bishop, however, was intent on arranging another marriage for her, although during the lifetime of her husband Elizabeth had made a vow of continence in case of his death; the same vow had also been taken by her attendants. While Elizabeth was maintaining her position against her uncle the remains of her husband were brought to Bamberg by his faithful followers who had carried them from Italy. Weeping bitterly, she buried the body in the family vault of the landgraves of Thuringia in the monastery of Reinhardsbrunn. With the aid of Conrad she now received the value of her dower in money, namely two thousand marks; of this sum she divided five hundred marks in one day among the poor. On Good Friday, 1228, in the Franciscan house at Eisenach Elizabeth formally renounced the world; then going to Master Conrad at Marburg, she and her maids received from him the dress of the Third Order of St. Francis, thus being among the first tertiaries of Germany. In the summer of 1228 she built the Franciscan hospital at Marburg and on its completion devoted herself entirely to the care of the sick, especially to those afflicted with the most loathsome diseases. Conrad of Marburg still imposed many self-mortifications and spiritual renunciations, while at the same time he even took from Elizabeth her devoted domestics. Constant in her devotion to God, Elizabeth's strength was consumed by her charitable labours, and she passed away at the age of twenty-four, a time when life to most human beings is just opening. Very soon after the death of Elizabeth miracles began to be worked at her grave in the church of the hospital, especially miracles of healing. Master Conrad showed great zeal in advancing the process of canonization. By papal command three examinations were held of those who had been healed: namely, in August, 1232, January, 1233, and January, 1235. Before the process reached its end, however, Conrad was murdered, 30 July, 1233. But the Teutonic Knights in 1233 founded a house at Marburg, and in November, 1234, Conrad, Landgrave of Thuringia, the brother-in-law of Elizabeth, entered the order. At Pentecost (28 May) of the year 1235, the solemn ceremony of canonization of the "greatest woman of the German Middle Ages" was celebrated by Gregory IX at Perugia, Landgrave Conrad being present. In August of the same year (1235) the corner-stone of the beautiful Gothic church of St. Elizabeth was laid at Marburg; on 1 May, 1236, Emperor Frederick II attended the taking-up of the body of the saint; in 1249 the remains were placed in the choir of the church of St. Elizabeth, which was not consecrated until 1283. Pilgrimages to the grave soon increased to such importance that at times they could be compared to those to the shrine of Santiago de Compostela. In 1539 Philip the Magnanimous, Landgrave of Hesse, who had become a Protestant, put an end to the pilgrimages by unjustifiable interference with the church that belonged to the Teutonic Order and by forcibly removing the relics and all that was sacred to Elizabeth. Nevertheless, the entire German people still honour the "dear St. Elizabeth" as she is called; in 1907 a new impulse was given to her veneration in Germany and Austria by the celebration of the seven hundredth anniversary of her birth. St. Elizabeth is generally represented as a princess graciously giving alms to the wretched poor or as holding roses in her lap; in the latter case she is portrayed either alone or as surprised by her husband, who, according to a legend, which is, however, related of other saints as well, met her unexpectedly as she went secretly on an errand of mercy, and, so the story runs, the bread she was trying to conceal was suddenly turned into roses.